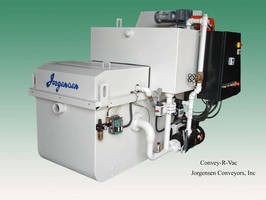 Jorgensen Conveyors will display its patented Convey-R-Vac® vacuum drum filtration system at IMTS 2010. "The Convey-R-Vac® is a unique permanent media filtering solution for metal cutting machine tools." "It performs to greater filtration efficiencies at lower micron particulate levels than any of the competition's gravity flow permanent media filter offerings," says John D'Amico, Co-Principal, Director of Sales & Marketing for Jorgensen Conveyors, Inc. "The filter drum remains stationary and a pump is used to pull the dirty coolant through the media." "We let a cake of swarf build on the filter media to aid in finer filtration". According to D'Amico, other conventional gravity flow drum filtering systems rotate the drum continually and back flush it because they have to rely on gravity to flow the coolant through the filter media on the drum. Because of this, the media must be continually cleaned. "This results in more migration of finer chips through the media on these systems," says D'Amico. On the Convey-R-Vac®, a cake builds on the media and as it continues to build up, the vacuum increases to a controlled set point. When it reaches that point the drum will index 120 degrees and go through a back flushing process to clean the filter media so that the machine tool's coolant flow rate can be maintained. The Convey-R-Vac system is particularly effective in cast iron machining applications where the conventional gravity flow drum systems do not perform well due to the high percentage of very fine particulate found in cast iron swarf. It also works very well in all other typical machining applications involving steel, aluminum, brass, etc. Jorgensen can integrate primary chip removal conveyors, secondary filtration, high pressure coolant pumps, coolant chillers and complete controls with the Convey-R-Vac for a turnkey system. Rotary Drum Filter provides liquid-solid separation. Automotive Oil Filters protect engines for up to 10,000 miles.